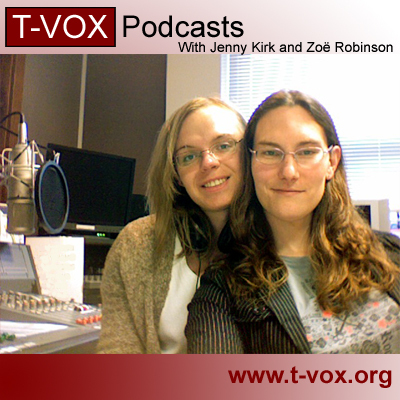 A cover image for the T-Vox podcasts, showing Jennifer Kirk and Zoe Kirk-Robinson in a radio studio. Zoe Kirk-Robinson is the co-founder and Director of T-Vox. She is Vice Chairman (Policy) of LGBTory, the Conservative Party LGBT group, and creator of Britain's first web comic. Born in Durham, she now lives in Bolton with her wife and a cat.